John McCain vs. Donald Trump in 1973 Meme - Truth or Fiction? Facebook group “The Other 98%” shared a meme contrasting the purported activities of John McCain and Donald Trump in 1973. 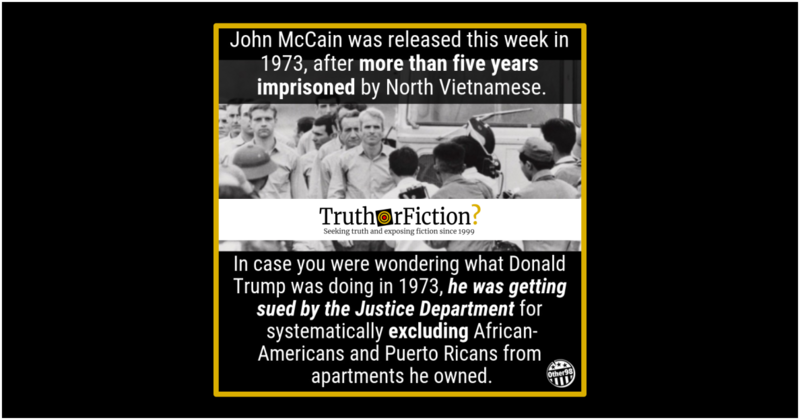 John McCain was released after five years of captivity in Vietnam in 1973, the same year Donald Trump was sued by the Justice Department for racial bias in real estate. President Donald Trump’s feud with the late Sen. John McCain dates back many years, to long before the real estate magnate launched a campaign for president. Trump, who occasionally re-airs his grievances with the late Arizona Republican, launched a new line of attack during an address in Ohio Wednesday, suggesting the McCain family never thanked him for “the kind of funeral that he wanted.” Trump’s role in the services were limited to allowing McCain’s body to fly on planes used as Air Force Two. John McCain was released this week in 1973, after more than five years imprisoned by the North Vietnamese. 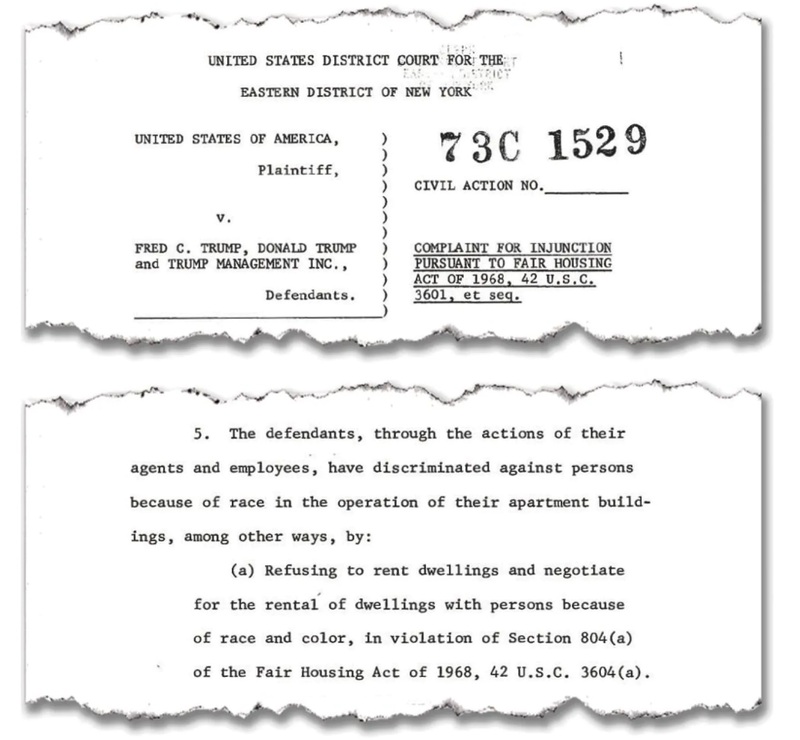 In case you were wondering what Donald Trump was doing in 1973, he was getting sued by the Justice Department for systematically excluding African-Americans and Puerto Ricans from apartments he owned. [March 14 2019] marked the 46th anniversary of John McCain’s release after being held captive as a prisoner of war at the Hanoi Hilton during the Vietnam War. McCain, who died [in 2018] at the age of 81 after a lifetime of service in the military and as a senator, was greeted by a cheering crowd at Clark Airbase in the Philippines on March 14, 1973. Then-Navy Lt. Commander John McCain was held captive in North Vietnam for five and a half years, from 1967 to 1973. The injuries he sustained would affect his mobility for the rest of his life. In October 1973, the Justice Department filed a civil rights case that accused the Trump firm, whose complexes contained 14,000 apartments, of violating the Fair Housing Act of 1968. The case, one of the biggest federal housing discrimination suits to be brought during that time, put a spotlight on the family empire led by its 27-year-old president, Donald Trump, and his father, Fred Trump, the chairman, who had begun building houses and apartments in the 1930s. The younger Trump demonstrated the brash, combative style that would make him famous, holding forth at a news conference in a Manhattan hotel to decry the government’s arguments as “such outrageous lies.” He would also say that the company wanted to avoid renting apartments to welfare recipients of any color but never discriminated based on race. “Donald started his career, back in 1973, being sued by the Justice Department for racial discrimination — because he would not rent apartments in one of his developments to African-Americans, and he made sure that the people who worked for him understood that was the policy,” Clinton said [during a September 2016 debate]. This case was brought against Fred and Donald Trump, and their real estate company, in 1973 in the U.S. District Court for the Eastern District of New York. We are working to obtain the relevant documents … In October 1973, the Justice Department filed this civil rights case in federal court in Brooklyn against Fred Trump, Donald Trump, and their real estate company. The complaint alleged that the firm had committed systemic violations of the Fair Housing Act of 1968 in their many complexes–39 buildings, between them containing over 14,000 apartments. The allegations included evidence from black and white “testers” who had sought to rent apartments; the white testers were told of vacancies; the black testers were not, or were steered to apartment complexes with a higher proportion of racial minorities. The complaint also alleged that Trump employees had placed codes next to housing applicant names to indicate if they were black. At the corporation’s main office, 600 Avenue Z in Brooklyn, Donald Trump, president, denied the charges. In Washington, J. Stanley Pottinger, assistant attorney general in charge of the Justice Department’s civil‐rights division, termed the suit the second major rental discrimination action begun by the department in the last two years. The first involved Samuel J. Lofrak, one of the country’s largest builders. The Justice Department had charged racial discrimination in the renting of 21,000 Lefrak‐controlled apartments in 150 buildings in Brooklyn and Queens. In the meme reproduced above, “The Other 98%” claimed that March 2019 marked an anniversary of Sen. John McCain’s release from a Vietnamese prison after five years of captivity. A CBS article reported that McCain had actually been imprisoned for five and a half years, but the claim was essentially accurate. 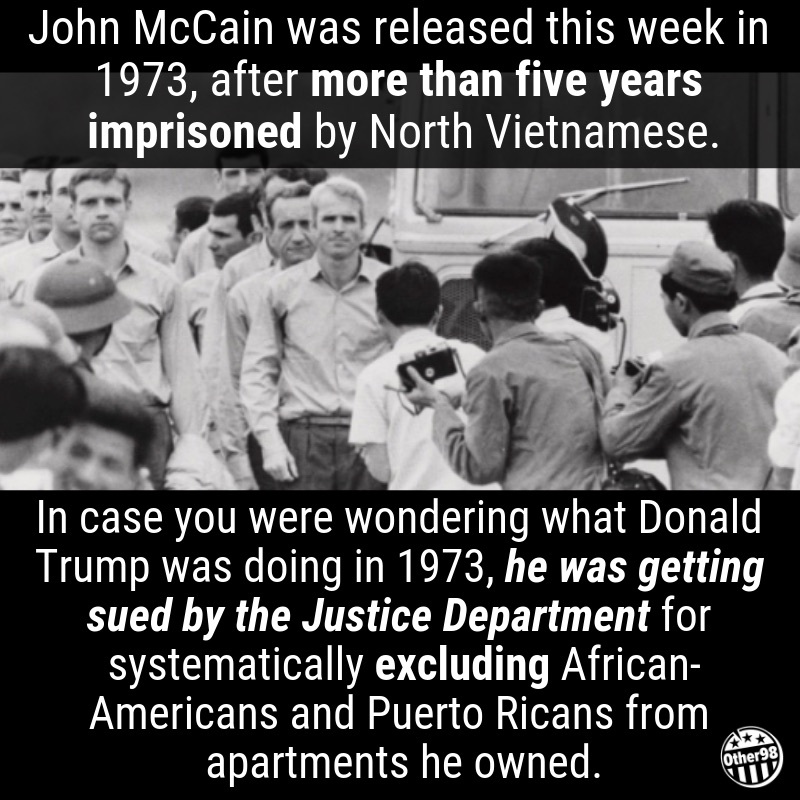 Additionally, the meme claimed that in 1973, Donald Trump was sued by the Justice Department for alleged violation of housing discrimination laws. That claim came to issue when Hillary Clinton raised it during a September 2016 debate, and was rated “True” by fact-checkers examining it at that time. In response, Trump claimed that the action taken against him was broad and included multiple developers. But an October 1973 article reported that the action was in fact specific to Trump and his father, reporting a 1971 suit filed separately against a separate developer in New York City. United States v. Fred C. Trump, Donald Trump, and Trump Management, Inc.